If you’re getting ready for an Aussie roadtrip adventure, you might be wondering how to keep everyone entertained. Going outback is great, but steering some kids away from the iPad to experience the wildness can be a challenge. Water activities is one of the best parts of camping throughout the warmer months. 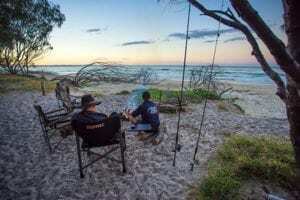 This is the perfect time to explore some of Western Australia too, with beach camping and National Park water holes offering the ultimate cool off. Summer camping trips across Australia means you and the family can experience anything from kayaking to swimming, boating, water skiing, fishing, snorkelling, tubing and so much more! Waterside campsites make keeping entertained and active easier. Whether you want to laze around and soak up the sun or adrenalin-filled water activities is more your thing, there are a ton of exciting things to do. Tip: If you’re bringing equipment for water activities, like canoes, fishing rods or surfboards, investing in a soft floor camper trailer or hard floor camper trailer can fit the bill just make sure you choose the right rig for your needs. Hiking is another great activity to do when you’re camping. You don’t have to be a hiking enthusiast either. But finding some trails to explore can encourage you to get at one with nature and take in the country’s beautiful surroundings. Bushwalks can be as adventurous or as relaxing as you desire. Make sure you check the location you’re wanting to camp at prior to the trip and find out what trails are nearby to explore. Nighttime landscapes can make for some beautiful photography. Tap into your creative side by experimenting with some nighttime photography. With a decent camera that allows you to set the shutter speed and lens aperture, you can capture the night sky in all its stunning glory. Camping offers the perfect excuse to study the stars too. If you’ve gone outback away from the city lifestyle, the display of stars is much more vivid and spectacular. Look for the Milky Way with the kids, see who can find the saucepan and three sisters first and grab some great snaps of the nighttime sky while you’re there. Exploring new locations come with it a chance to experience the local culture too. Even if you’re only a few hours away from home, eating and living like the locals opens up a world of new opportunities and fun to be had. Put some time aside to visit the locals. Head into the town city, check out the shops and find some local activity inspiration from the tourist centre. If you’d like more information on which camper trailer to buy, contact a team member today.